2016 saw public criticism that candidates pushing their early 70s would be too old to serve as US President, but 18 years ago a man took on the grueling physical stress of space flight at the age of 77. On October 29, 1998, NASA’s space shuttle Discovery carried Senator John Glenn into orbit for a nine-day mission (STS-95). It was three months prior to his retirement as US Senator representing Ohio, but almost 37 years after his previous space flight, which occurred February 20, 1962, when Glenn was just 40. After returning to Earth a second time, Glenn lived another 18 years and died yesterday, December 8, 2016, at the age of 95. 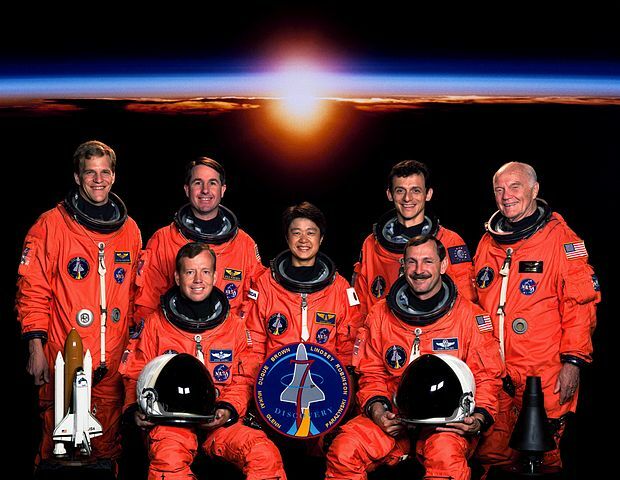 The STS-95 pre-flight portrait with U.S. Sen. John H. Glenn Jr. as the payload specialist. The heat shield held, but that mission could be remembered as the first in-space emergency. It was also the first mission whose trajectory NASA calculated using an electronic computer. Since the use of a computer was untested, Glenn asked just prior to launch to have all the calculations checked by the mathematician he trusted the most. From his seat in the capsule, he said, “Better have Katherine verify it,” referring to Katherine Johnson, NASA’s now famous human computer, who is now 98 years old and still with us. 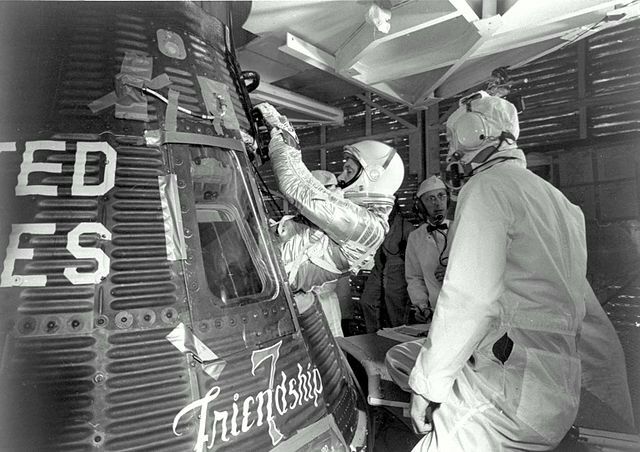 Project Mercury astronaut John H. Glenn, Jr. enters his Mercury Friendship 7 capsule before launch on February 20, 1962. As one of NASA’s original seven astronauts, Glenn enjoyed a previous career as a military test pilot, but the bulk of his career he spent in politics. At the urging of Robert Kennedy, Glenn ran as a Democrat for a U.S. Senate seat in 1964, but had to withdraw after suffering a head injury. He actually became U.S. Senator from Ohio in 1974 and remained in that position until January 1999. Why did NASA send a 77 year-old politician on a 9-hour flight, a man whose earlier space experience had been for five hours at the age of 40? The basic idea was to utilize Glenn as his own age control. By comparing Glenn’s physiological and medical data during the high-G launch, reentry, and weightless phases of the flights, researchers hoped to gain some kind of insight on the effects of aging. This is because weightlessness affects the body similar to aging on various body systems, such as the cardiovascular system and bones. How much did medical researchers actually learn from studying Glenn? Well, we need to keep in mind that that aging studies, space medicine studies … pretty much all studies require a good database. Using age as a variable for space flight, Glenn amounted to a single datum. But once more people start going into space in their retirement years, those data could be combined with results that were obtained from Glenn. Maybe that’s a good reason for building a retirement hotel on the Moon.